Just over Chelsea way in Manhattan, is a man who takes mixing very, very seriously. 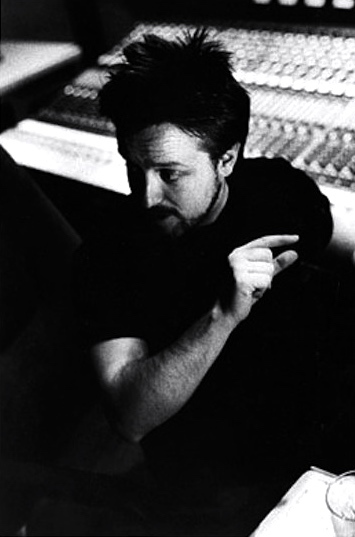 The discography of Chuck Zwicky is deep and diverse, stacked with hitmakers that include The Rembrandts, Reggie Watts, Soul Asylum, Prince and Information Society, along with plenty of new blood. Visit his sun-soaked mixing HQ, and you’ll see he takes his own unique approach to mixing, evident from the gear he selects and the plugins he personally designs. The results he achieves speak for themselves (and you’ll find plenty of examples below), but its the way this mixmaster goes about his craft that increases the inspiration. Equal parts audio artist and scientist, Zwicky is more than happy to tune you into his techniques. 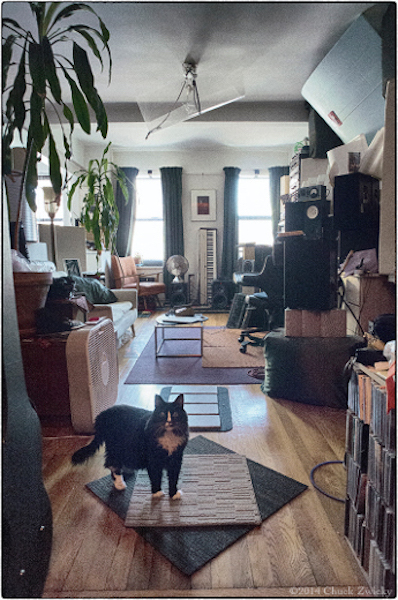 Manhattan based Mixing engineer: I have a private mix room in Manhattan with the best outboard gear on the planet, seamlessly integrated into my hybrid setup. Over 50 channels of outboard compression, 24 channels of outboard EQ and all perfectly calibrated so that recalls are *never* a problem. Plenty of sites offer a biography of CZ, but they’re all professional biographies, not supplying information like when he was born and where he grew up and how he ended up in his current occupation. [Though] Swiss settlements like Highland (Illinois), New Glarus (Wisconsin), New Bern (North Carolina), Gruetli (Tennessee) and Bernstadt (Kentucky) were emerging fast, most Swiss preferred rural villages of the Midwest [especially OH IL WI IN] and the Pacific Coast, where especially the Italian Swiss were taking part in California’s winegrowing culture, or then took up residence in more industrial and urban regions such as New York City, Philadelphia, Pittsburgh, Chicago, St. Louis, Denver, or San Francisco. … Along with the Swiss Immigrants came their traditions. By the late 1800s sufficient numbers of Swiss had arrived that Swiss Vereins (Clubs) were established to provide camaraderie and sharing of customs and traditions of the Heimat (Homeland). The William Tell Verein of Oakland and the Helvetia Verein of Sacramento, founded in the 1890s, were examples of clubs formed during this period. Much later, the West Coast Swiss Wrestling Association was established to preserve the Swiss tradition of Schwingen (Swiss wrestling) on the Pacific coast of the United States. The fourth weekend after Labor Day is a magical time in Sugarcreek located just 8 miles from Interstate 77 in Tuscarawas County. It is a time when Swiss is queen and cheese is for all during an event known as the Ohio Swiss Festival. There will be 64 candles in the Ohio Swiss Festival birthday cake this year. There will be everything Swiss from cheese to alphorns and, of course, singers and plenty of polka [with accordions]. According to many, it’s the event that put Sugarcreek on the map and it’s back for its 63rd edition. 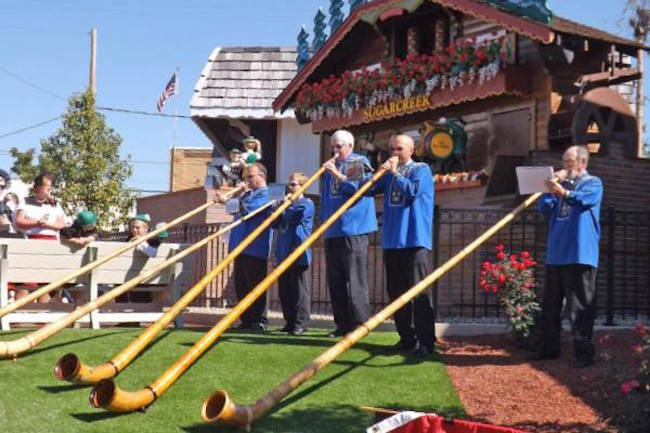 Billed as one of the most popular outdoor festivals in the state, the Ohio Swiss Festival brings old world charm to life and gives visitors plenty of opportunities to experience uniquely Swiss culture. As the name would indicate, Swiss cheese takes center stage at the festival as area cheesemakers compete for the title of Grand Champion, or best in the business, according to the Ohio Swiss Cheese Association. … For those who like a little sport, Steinstossen (stone throwing) is a traditional Swiss sport in which male contestants hold 138 pound stones over their head and hurl them for distance. Woman toss 75-pound stones. An open competition starts on Friday evening and continues through the weekend with the final contest set for Saturday evening at 7:30 p.m.
Don’t forget the food as there are vendors from far and wide. There are churches who sell authentic Swiss cookies and others who share fry pies. There are booths with pasta and, of course, fried Swiss cheese. A chicken barbecue and bratwurst meal will be served up in style at the fire station throughout Friday and Saturday. … For those who want to try their hand at yodeling, a contest will be held on Saturday morning at Noon at the Main Street stage. A Swiss costume contest is also planned. This entry was posted on October 17, 2016 at 7:26 am and is filed under Events and occasions, Music, My life, Names, Zwickys. You can follow any responses to this entry through the RSS 2.0 feed. You can leave a response, or trackback from your own site.